Sometimes less is more: less in-your-face, less over-the-top, less distracting. This stylish return address label design doesn't scream for attention. It just does its job - giving your letters and packages a professional appearance and making your life a little easier. Because these are self-adhesive labels, there's no need to scribble out your name and address on all that outgoing mail. Stick them in their place and move on with your day! This a straight-forward product that provides and attractive finishing touch. 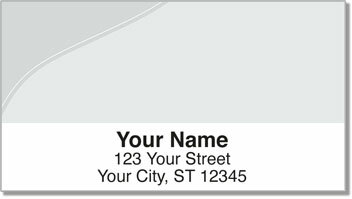 Make Silver Curve Address Labels yours right now. If you are looking for something more colorful - this design is available in a variety of other shades.